Our 2018 boxed calendars are now available! 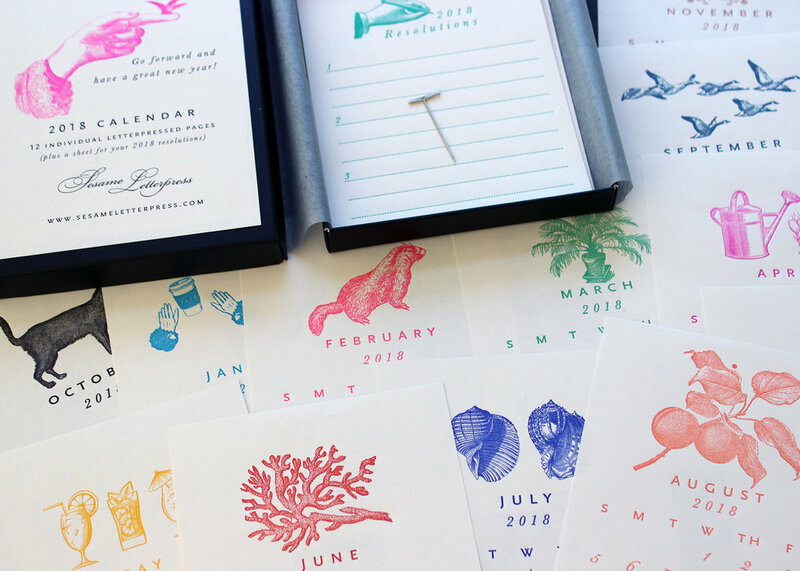 Each year, we come up with new images that represent the spirit of each month, and print them in bright colors that are sure to look great pinned above any desk. These are great gifts for friends and family, and can be found in our website shop. We usually sell out, so don't wait to pick one up before the new year! Who can believe we're already in November? 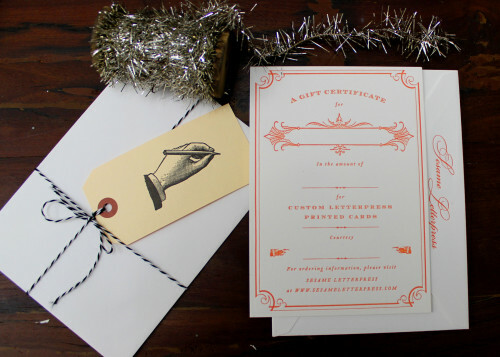 Classic letterpress printed note cards make great, custom wedding gifts. There's nothing nicer than receiving a handwritten note in the mail from after attending a wedding. 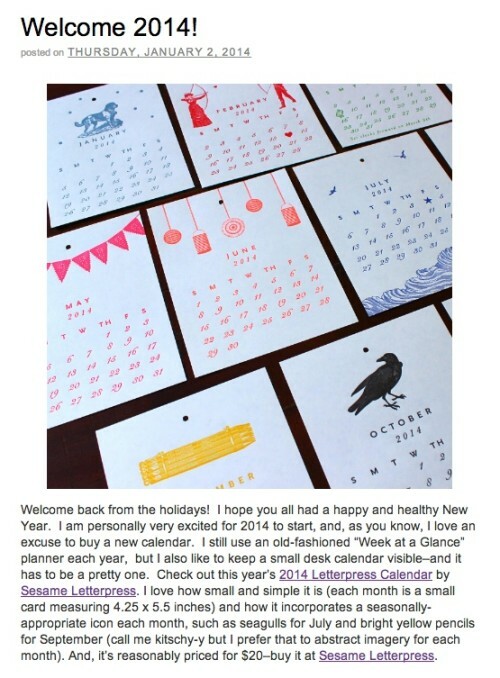 Check out the Social Stationery section of our website for different designs for your next order. Are you ready for some turkey? (We're ashamed to say that was sung to the tune of the Monday night football theme.) We're not sure how it happened, but Thanksgiving is only days away. Between pouring over recipes on the internet and cooking up some truly delicious letterpress goods, we haven't had time to figure out what we're bringing to dinner this year! If you're hosting Thanksgiving this year, send your guests home with cute homemade doggy bags, filled with a leftover turkey sandwich and a piece of pumpkin pie. You'll gain some space in your fridge, and your guests will go home happy! Provisions by Food52 is a great resource for unique products for your home. If you're heading to a friend's home for your Thanksgiving festivities, nothing says thanks for the stuffing like this handmade porcelain pitcher. 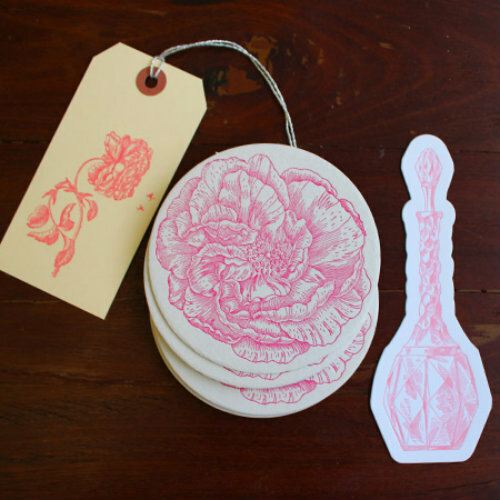 Or show your appreciation with this adorable whisk necklace or a set of our letterpress holiday coasters. Maybe you're hosting this year and are trying to put together the perfect table setting. Try having your guests write down what they're thankful for on one of our letterpress tags and share their thoughts during dessert. They also come in handy at the table as place cards. It's a lovely, personalized touch for planning your seating at dinner. This year, we're making an effort to buy our holiday gifts from small, local businesses. It just feels better to purchase something from a business in your community than a big box store. We'll be celebrating Small Business Saturday from Thanksgiving to Sunday, the 30th. Get a 10% discount of your entire order from our website using the code SBS2014. Halloween is just around the corner, so we wanted to share some of our spookiest goods with you. Give your home just the right amount of fright for your festivities! Our new raven coasters will be the perfect accent to your Halloween party. Or these might be the perfect gift for a friend who likes their home to be just a little bit dark and creepy all year long. We have bags of mystery to fill with all kinds of goods for little ghouls and gals and bats to swoop in to say hello to friends and family. We just love this time of year, when we can embrace our spooky side. Will you be tricking or treating this Halloween? We've added a few new designs to our line of coasters. Both of these are inspired by memories of holidays by the beach and searching through the sand for shells and little crustaceans! These would be perfect for a beach wedding or a BBQ beside the sea. They are also the perfect gift for hosts who live near the ocean. The coasters are beautifully packaged in individual sets of eight. You can choose the blue crab coasters or the coral scallop coasters. Or go ahead and treat yourself to both! Just when it feels like we've emerged from the holiday rush, we have another nice little burst of busy-ness in early January! 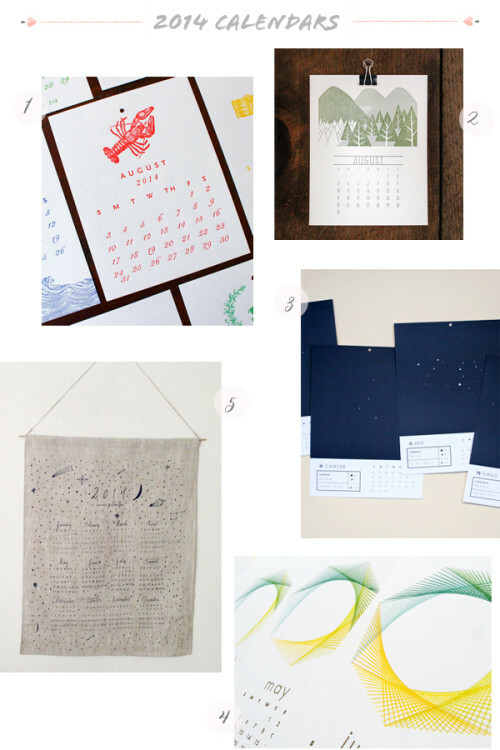 All of a sudden, it's time to start thinking of the year ahead and - more specifically - a pretty new calendar! Our 2014 calendar has been flying off the shelves and we are delighted! Our customers love the small scale of it, the bright colors and the pretty, seasonal illustrations. 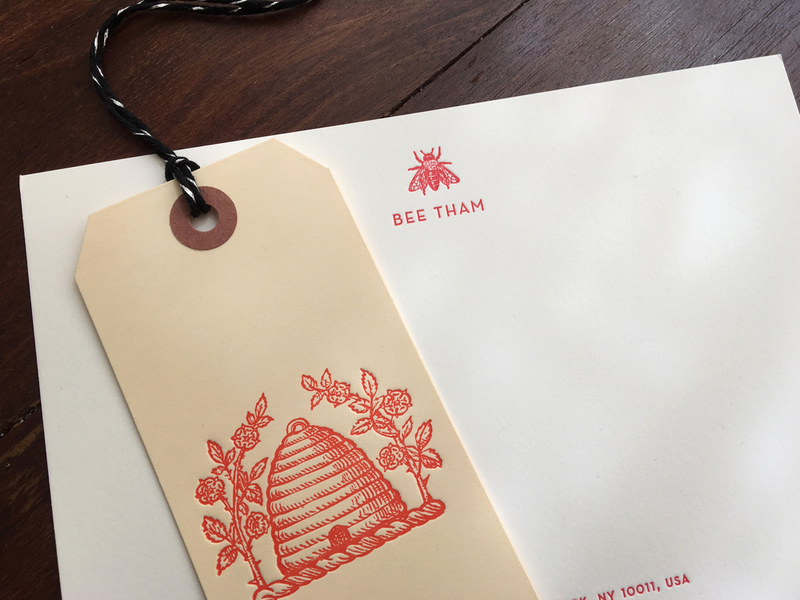 We often hear from clients that they would love to buy bespoke stationery for a friend or family member but the recipient is a little - shall we say - specific about the type of design they like. Well, we like to play the role of problem solvers so we have designed and printed these beautiful luxury gift certificates that will solve the present-giving dilemma for even the most picky of your loved ones. That's right; we'll fill in the details and beautifully wrap the card with twine and our pretty 'writer' gift tag. And voila, you're all set for another holiday season! You can purchase a set value gift certificate directly from our online shop ($150 covers the cost of a gorgeous set of 50 bespoke notecards and matching blank envelopes). If you would like to buy a gift certificate for a custom amount, please get in touch! Each year, we enjoy the process of selecting images and collating our little 12 month calendar. 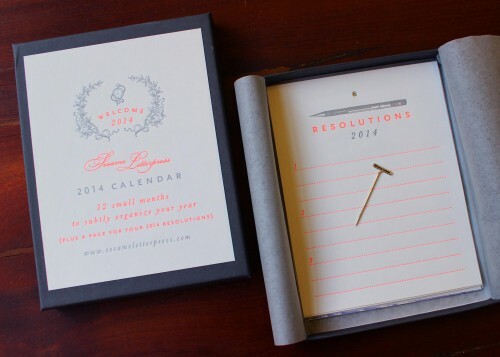 The small format is perfect for a teeny office cubicle or a bulletin board in a nook at home. For 2014, we've added lots of awesome new imagery, including a beautiful seascape in navy for July and a cheery bright lobster for August. 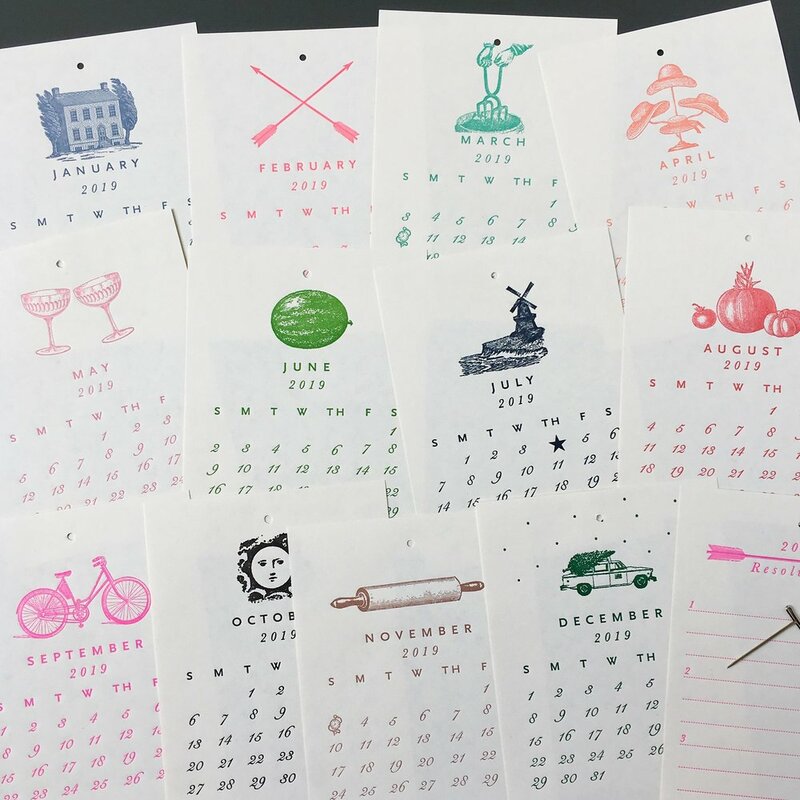 Display your calendar on the enclosed tack and tear off the pages as the months go by or arrange all 12 sheets in a frame for a pretty collage of the coming year. And don't forget to fill in the list of resolutions! You can buy a calendar straight from our website here. Elana chose our floral coasters for her wedding. We love how Elana chose a simple twine with flecks of gold and then further customized each pile of coasters with hand-calligraphed name tags in gold. Here's another shot which shows how the colors and gold accents were picked up throughout the wedding design. Congratulations Elana! Thanks so much for choosing our floral coasters to go with your wedding theme!